Honeywell International Six Sigma Plus teams have yielded dramatic improvements across the entire organization. From left: Paul Chapman, Bobby Hawthorne and Jim Tatum are part of the team responsible for the Vertical Cavity Surface Emitting Laser (VCSEL), one of Honeywell's fastest growing new products. What happens when two companies with two distinct and effective quality management systems (QMSs) are merged? Ideally, the two systems are integrated to form a new system containing the most effective elements of each and shedding those that are redundant. At the time of their 1999 merger, both AlliedSignal and Honeywell had years invested in their respective quality systems. Nevertheless, management would have to face the Herculean task of combining the two. In 1994, Rick Schroeder, AlliedSignal's vice president of operations, brought his Six Sigma experience from Motorola to his new employer. By 1999, AlliedSignal was five years into its Six Sigma program, which headed the company's effort to capture growth and productivity opportunities more rapidly and efficiently by reducing defects and waste in all of its business processes--resulting in a $600 million annual savings. Meanwhile, Honeywell had developed its own QMS--the Honeywell Quality Value (HQV) program--an assessment process based on the Malcolm Baldrige National Quality Award criteria. AlliedSignal's Six Sigma efforts had developed a strong reputation, both internally and externally, for accelerating improvements in all of the company's processes, products and services and reducing the cost of poor quality through waste elimination and defect and variation reduction. Nevertheless, the merger between AlliedSignal and Honeywell--or more accurately, between the two companies' QMSs--would reshape that Six Sigma program. Its new name would be Six Sigma Plus. The QMS of the melded companies, known as Honeywell International, is driven by Six Sigma Plus. The company now employs more than 120,000 people who work in 95 countries and offer aerospace products and services, electronic materials, home and building control, industrial control, performance polymers and chemicals, turbine technologies, and transportation products. Whether flying on a plane, driving a car, heating or cooling a home, furnishing an apartment, taking medication for an illness, or playing a sport, most people use Honeywell International products in some way every day. Following the merger, Honeywell International CEO Michael R. Bonsignore made clear the future of Six Sigma at the new company: "As a new organization, our challenge is to continue the performance improvements of our predecessors, delight customers and achieve aggressive growth. Six Sigma Plus will drive growth and productivity by energizing all of Honeywell International's 120,000 employees worldwide--providing the skills and tools to create more value for our customers, improve our processes and capitalize on the power of the Internet through e-business. I am determined to make it a way of life at Honeywell International." Ray Stark, now Honeywell International's vice president of Six Sigma and productivity, led the effort to incorporate elements of both former companies' QMSs into a coherent and improved system. "When we merged the two companies, Arnie Weimerskirch, the father of Honeywell's HQV, and I got together to discuss our respective quality management systems," says Stark. "We concluded that the new company would be served very well if we could take the best practices from these quality management approaches and bring them together. And that is how Six Sigma Plus was born." Using Six Sigma Plus methodology, an Industrial Control team developed a reliable, cost-effective family of chips and assembled components for the burgeoning data communications market. As a result, Industrial Control achieved a 500-percent increase in revenue growth, resulting in a year-over-year increase in operating profits of several million dollars. Cycle time was reduced 35 percent, and yields increased from 75 percent to 93 percent. More than 300 staff members, both in quality control and research and development laboratories across several Honeywell International businesses, participated in a customized Green Belt learning program to improve measurement systems. This sharing of best practices, resources and expertise has benefited the development of new products and the quality control of existing products. At the same time, it has helped save nearly $8 million. Aerospace Services, using Six Sigma Plus, merged activity-based management and lean manufacturing techniques at its Raunheim, Germany, facility. The site repairs auxiliary power units, propulsion engines and components that provide air conditioning and other power-related features aboard aircraft. The site impressed customers over the past two years with a 43-percent reduction in components repair time. It helped Honeywell International achieve a $47-million increase in revenue and was a major factor in $900,000 worth of productivity improvements. A turbocharging systems team in Mexicale, Mexico, part of the Transportation & Power Systems business, used Six Sigma Plus and lean tools in teardown and cleaning processes. This reduced cycle time by 92 percent and space by 51 percent, eliminated the use of chemical substances for cleaning operations, and saved $400,000. In addition, Six Sigma Plus has been useful in helping to reduce warranty expense and computer downtime and improving the integrity of an employee database. Six Sigma Plus combines the former AlliedSignal's formidable Six Sigma program and elements of the former Honeywell's HQV method; lean enterprise, a lean manufacturing component; and activity-based management (ABM), which aids in analyzing customer profitability and targeting future costs for new product development. "One of our competitive advantages is our ability to integrate in a holistic way all of these tools and methodologies to bring greater value to our customers," explains Edward M. Romanoff, Honeywell International's communications director for Six Sigma Plus and productivity. "Lean helps us to reengineer a process to focus only on customer value-added elements. ABM helps us to understand the profitability of our products and services and to tailor our business models appropriately. The HQV process is being streamlined, timed to affect our annual operating plans, and geared to help our businesses prioritize remedial process improvements that affect customers and the financial well-being of the business. "These two pieces--Six Sigma and HQV--come together nicely in that the latter provides the framework for how one should run a business in total, and Six Sigma gives you the quantitative specifics of what and how to improve." But as well as HQV and Six Sigma may complement each other, their functions, goals and capabilities vary greatly. Responsible for developing and implementing Honeywell International's Six Sigma Plus strategy, Stark was charged with ensuring that both elements were understood and used to their maximum potential within the company. "The Baldrige criteria might mandate that a company measure a given product's performance from a customer's perspective," explains Stark. "And if no such reporting mechanism existed, the Baldrige examiner would suggest that best-performing companies have this kind of system and that your company should put one in place. With a Six Sigma QMS, we would not only say you should put something in place, but we would give you the specific measurements that would help you understand the capability of the product. And it would be done in a way that would allow you to index its quality against a yardstick that we call Six Sigma." Being able to effectively use that yardstick meant training. While employees of the former AlliedSignal needed to learn about the HQV elements added to their Six Sigma program to create Six Sigma Plus, the more formidable challenge was training employees of the former Honeywell in Six Sigma methodology, a program never developed or implemented there. The first step was holding a series of leadership orientations aimed at teaching Six Sigma basics to the management. "Once they understood what it was and how it could be deployed, we then selected individuals out of each of these businesses that would be trained through application--they would learn how to apply these tools in particular projects," reports Stark. "They would then become the originators of process improvement and the experts of the application of these tools within their businesses." Honeywell International uses Master Black Belts to guide those Six Sigma Plus leaders. "Those individuals then go through their learning experience, guided by the Masters, with the objective of driving real results consistent with the goals and needs of their business," Stark continues. "Therefore, the result will be an improvement of some fashion, whether that be taking cost out of the process, avoiding extra cost, bringing a product to market faster or creating a new e-business channel." But "training" doesn't accurately characterize Honeywell International's project-based educational system. "Our program is not about training, it's about learning," explains Romonoff. "You can put people in a classroom and give them statistical training. You can give them hypothetical examples to make your point and people do learn, some faster than others. But the part that's unique here is that people come into this mentored environment with a project beforehand. It's something that they or their business particularly needs done. And they're given that project and asked to go and learn about these tools and how they can apply them to get a desired result or outcome. It's very much results-orientated." And management expects this newly gained knowledge to trickle down the corporate structure as soon as the training is completed. Employees who complete the program are expected to go back to their business and complete two to three Six Sigma projects per year. Additionally, they are to mentor as many as 10 groups of employees a year in their Six Sigma Plus learning curve. "So if that's 10 teams at 10 people each, you've got 100 employees that can be potentially impacted by this one individual," explains Stark. "So it's very important that these people have the team-dynamic skills to deal with different types of people, behaviors and situations. At the end of the day, what we want is at least a simple understanding of the applications of these tools by every employee." Also key to training employees in Six Sigma Plus is Honeywell International's Growth Green Belt program, which aims to bring Six Sigma quality to every aspect and department of the company--whether it be marketing, human resources or sales. As the company expands the reach of Six Sigma Plus methodology well beyond traditional manufacturing-based projects, several hundred teams led by its Growth Green Belts have engaged marketing and sales professionals, design engineers, and others in a quest to deliver customer value by developing new products and services. One of the first Growth Green Belt teams successfully boosted revenue at the Honeywell International Performance Polymers and Chemicals' Specialty Wax and Additives business by creating a product that expanded candle applications. Another helped extend the commercialization of a particular product to a new application. "When we apply the DMAIC methodology to nontraditional projects, we see dramatic results that equal or exceed those we have seen in the manufacturing arena," notes Stark. Green Belt--A person with working knowledge of Six Sigma Plus methodology and tools, who has completed training and a project to drive high-impact business results. Black Belt--A highly skilled Six Sigma Plus expert who has completed four weeks of classroom learning and, over the course of four to six months, demonstrated mastery of the tools through the completion of a major process improvement project. Master Black Belt--The Six Sigma Plus expert most highly skilled in the methodologies of variation reduction. After a year-long project-based certification program, Master Black Belts train and mentor Black Belts, help select and lead high-value projects, maintain the integrity of the sigma measurements, and develop and revise Six Sigma Plus learning materials. Lean Expert --A person who has completed four weeks of lean training and one or more projects that have demonstrated significant, auditable business results and the appropriate application of Six Sigma Plus lean tools. Lean Master--A person highly skilled in implementing lean principles and lean tool utilization in diverse business environments. Certification involves one year of intense study and practice in advanced lean tools, teaching and mentoring. ABM Expert--A person who has demonstrated proficiency in activity-based management (ABM) through a business application involving product costing, process costing or customer profitability analysis. Certification involves attending an ABM training course, defining a meaningful project, displaying knowledge of the ABM tools and using the data for key decision making. ABM experts frequently link Six Sigma Plus tools to projected and actual financial results. ABM Master--A person who has the skills of an expert plus the ability to develop and deliver ABM learning courses. Certification typically takes one year and involves demonstrating the use of ABM data for multiple purposes with repeatable and sustainable results. ABM Masters are proficient in the use of advanced cost management tools and have the ability to tailor cost data and analysis to a business's vision and strategy. TPM Expert--A person who applies total productive maintenance (TPM) and reliability methodologies and tools to assist or lead teams in optimizing asset capacity-productivity at minimum life-cycle cost. A TPM Expert is responsible for determining critical equipment and measuring its overall effectiveness, thus enabling growth and productivity through optimum asset utilization. TPM Master--A highly skilled individual experienced in the use of TPM and reliability tools and methodologies. TPM Masters' responsibilities include assisting leadership in identifying high-leverage asset improvement opportunities; leading critical, high-leverage improvement projects in a business; and leading cultural paradigm shifts from reactive to proactive asset management. One nontraditional element of Six Sigma Plus is e-business. Several Honeywell International businesses have a number of initiatives underway to take advantage of the power of the Internet's instant, convenient and global nature. MyPlant.com, MyAircraft.com and MyFacilities.com are the front-end portals, originating out of Six Sigma Plus projects, that customers are using to buy Honeywell International's services and products. Additionally, Honeywell International's Aerospace Electronic Systems has a WebPlan tool to link customers and suppliers for a seamless sales and operating plan process. Honeywell International's Consumer Products Group has established an e-solution to speed response time to changing customer demands and reduce inventory assets across the entire supply chain. And Honeywell International's Global Business Services has also enabled online travel planning, which in addition to increased accessibility and convenience, saves the company millions annually. To gain the full benefit of these Internet applications requires a step-function focus from the Six Sigma Plus efforts to improve the integrity of the data used, reduce process defects and variation, and speed the flow of information and physical assets from customer to supplier across the supply chain. Honeywell International's continuous performance improvement projects, dating back to AlliedSignal, have established an impressive track record of providing considerable payoffs in quality, on-time delivery, and competitively priced products and services. And Honeywell International management has put into place a system that continues to build on its successes, continuously striving for more improvement. To this end, Honeywell International has committed to providing every employee with 40 hours of learning each year. The company has earmarked millions of dollars to give each of its 120,000 employees an opportunity to learn and embrace Six Sigma Plus fundamentals, which Honeywell International believes will result in concrete growth, improved productivity and increased efficiency. 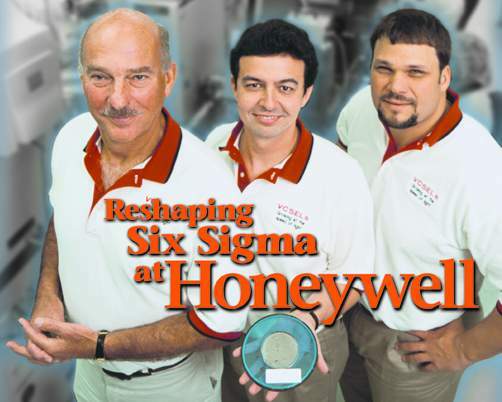 In 1999, Honeywell savings related to Six Sigma amounted to more than $600 million. Year 2000 cost savings provided by Six Sigma Plus are expected to save at least as much. Honeywell International recently began offering its Six Sigma expertise exclusively to its current suppliers and customers. Services offered range from full deployment, where Honeywell International helps these partners develop and implement an entire customized Six Sigma Plus program, to simple advice. Those customers and suppliers that choose to take advantage of the Six Sigma Plus commercialization can consult with a Honeywell International Six Sigma Plus expert about a particular problem, attend Honeywell International Six Sigma Plus training courses, participate in Honeywell International interactive online seminars, or have Honeywell International Master Black Belts deployed to their site to improve their processes and restructure their businesses. However, recent news puts the state of many former programs very much up in the air. At the end of October, Honeywell International announced it had accepted a $45-billion acquisition offer by General Electric (GE). Pending only shareholder and regulatory approval, the leadership of the two companies will soon begin a process with which Honeywell International management is already very familiar. While it's not clear what changes the pending GE acquisition will bring, it's likely that Stark, who will head the integration process for Honeywell International, will lobby to build on the success of his company's Six Sigma Plus program. And no company is better situated to make the most of Honeywell International's methodology, trained personnel and Six Sigma-based philosophy than General Electric. Soon after a May 1995 address to GE executives by Lawrence Bossidy, former vice chairman of GE and then CEO of AlliedSignal, GE quickly became a leading supporter of and participant in the Six Sigma movement. "One of the interesting aspects of the proposed GE acquisition is that we both speak the same language," comments Stark. "Both of our programs are rooted in the same philosophy. And this is one of the things that will be a real benefit in terms of the companies coming together. We are coming from exactly the same perspective when it comes to Six Sigma and its application, helping to drive growth and productivity and satisfying customer requirements." Robert Green is Quality Digest's assistant editor. E-mail your comments to honeywell@qualitydigest.com .